“One of the great displays of musical oratory comes in “Alexander’s Feast,” the Handelian ode that brought the Philharmonia Baroque Orchestra’s season to a splendid close in Berkeley’s First Congregational Church on Sunday night…[T]he orchestra, led with wit and panache by Music Director Nicholas McGegan and graced by the presence of three excellent vocal soloists, played it superbly. Read more on SFGate.com. “McGegan placed the four-movement concerto between the two acts of the oratorio; under his energetic direction and featuring Philharmonia’s excellent violin section led by concertmaster Elizabeth Blumenstock, it received a zesty, buoyant performance. “Is there a lover of Baroque vocal music who does not eagerly await Nicholas McGegan’s annual spring jaunt with Handel? What other conductor and Bay Area Baroque ensemble can invest the master’s operas, oratorios, and not so easily classifiable vocal creations with such an irresistible combination of rhythmic verve and sheer delight? “…The evening belonged to McGegan and Labelle. “The perfection of sound and blend that Bruce LaMott has achieved with the Philharmonia Chorale must be the envy of early music conductors worldwide. “The first half of the evening was dominated by Dominique Labelle. If you were stone-cold deaf and not immediately won over by her honey-toned coloratura, you’d be taken in by her laugh-aloud simpering treatment of several airs… Her theatrics alone are worth the price of admission. “The second half of the evening belonged to Dann Coakwell and Philip Cutlip. Since the concert, I’ve downloaded a half-dozen treatments of the air ‘The king seiz’d a flambeau,’ and none of them comes anywhere close to Coakwell’s treatment. Likewise, the ferocity of Cutlip’s ‘Revenge, revenge, Timotheus cries’ gave the second half an intensity not found earlier in the evening. “Adding vigor and consummate musicianship to the mix was cellist Steven Isserlis, whose solo work in Schumann’s concerto was nothing short of exemplary… His playing Friday in the fervently imagined, richly scored 1850 work captured its vivacity and remarkable depth of feeling… The cellist sailed through the work’s manic episodes and mournful interludes, negotiating its hairpin turns with keen articulation and a wide range of dynamics in the outer movements. And he conferred glowing, rapturous tone on the slow, long-breathed central movement. “For his part, McGegan deftly steered the performance through Schumann’s fleet passagework, eliciting brisk, unified playing from each section of the orchestra and enforcing a welcome sense of restraint in the score’s moments of quiet reflection. “That greatest of all `English’ composers, Handel, welcomed us with his symphony from Saul. This piece from Handel’s fourth English oratorio was the perfect choice to open a set featuring a world-class orchestra and a guest conductor who also happens to be one of early music’s most technically gifted harpsichordists. “Oboist Marc Schachman’s playing of rapid, Italianate passagework was stunning. “Egarr is a charismatic, energetic, and musically sensitive performer, who clearly brought a huge helping of enthusiasm to the table. The audience gobbled up every morsel he delivered… Egarr’s appeal extended far beyond these ancillary features. At the root of it was his consummate musicianship. “Throughout the evening Egarr made his mark with lively interpretations. He was both comfortable and capable in the period practice of performing while conducting. His rapport with the ensemble was good… the evening proceeded at a brisk pace that well suited its diverse breadth of offerings.” Read more online. “Guest-conducting the Philharmonia Baroque Orchestra, Richard Egarr, aimed at striking a balance between celebrating the peculiarities of the period, while reinvigorating modern interest in the musical era. “Egarr displayed exquisite control over the emotional direction of pieces, producing dynamic movements with fine-tuned transitions between pristine calms and violent crescendos…” Read more online. “Egarr’s considerable keyboard skills were on display for the better part of the evening as he conducted from the harpsichord. It’s often easy to overlook the harpsichord as it chugs along in the background, providing the basso continuo that drives the music forward. However, in the hands of Egarr, it becomes variously percussive, mournful, exuberant – all the while pushing the music forward. “Principal March Schachman and Gonzalo Ruiz, both on oboe, tendered compelling performances..
“The Philharmonia Baroque excels at uncovering unknown or relatively unappreciated gems, such as Williams Lawes.” Read more online. “Twenty years ago, Nicholas McGegan recorded Handel’s “Messiah” with his Philharmonia Baroque in what felt like a revelatory performance of an overly familiar work. Tuesday night, McGegan and his Bay Area period-instrumental ensemble brought their current “Messiah” to Walt Disney Concert Hall for the first of two performances. Two decades in the life of an oratorio that has been a repertory staple for nearly 270 years -– it is the only Baroque work that has never been out of fashion -– shouldn’t make all that much difference. But it can. “That older McGegan “Messiah” does, in fact, hold up well. It is lively. It makes its musicological points with infectious glee. And it featured some timeless singing, especially in the deeply affecting soprano solos by the incomparable Lorraine Hunt. “The performance at Disney had a different, deeper character. No longer making points, McGegan now was content in simply pointing out the musical wonders of Handel’s score. It was a mellow “Messiah,” richly expressive, never exotic. The lessons of musicology have been absorbed into a complex and rich new performance practice. “Coloratura singing, as a wise observer remarked, is a bit like dancing on pointe: bizarre and unnatural, but powerfully compelling when done well. Vivica Genaux does it very well indeed. “The American mezzo-soprano made an all-too-rare return to the Bay Area on Friday night, appearing in Herbst Theatre with Nicholas McGegan and the Philharmonia Baroque Orchestra with a collection of Baroque opera arias. Then she proceeded to give a virtuoso display of precision vocal fireworks. “Philharmonia Baroque brought mezzo-soprano Vivica Genaux to Berkeley on Saturday, and her singing brought down the house. Her first group of arias were by Vivaldi. The second included arias by Nicola Porpora and Riccardo Broschi, written for the celebrated castrato Farinelli. “Her low voice is gorgeous, and the beauty of her sound carries throughout her range. Her mastery of florid passages and added ornamentation — including inventive cadenzas — is peerless. Her tuning is impeccable. And her connection with her audience is enhanced by her vivid portrayal of character in every role she assumes. “It’s a tribute to Kelley, or Mozart, or both, that this Frankenstein patchwork emerged as a perfectly credible three-movement concerto. Kelley certainly gets credit for the performance, which was tuneful, lively and full of ingenious turns. “He flew through the challenging passagework of the final rondo with aplomb, and brought a dark, lustrously singing tone to the central slow movements. ..
“Throughout the performance, I was struck by the group’s successful injection of unfamiliar elements into music so omnipresent that it sometimes seems inescapably familiar… The dichotomy was achieved partly by brilliant programming. “Not only did Music Director Nicolas McGegan’s programming for this concert manage to blend the familiar and unfamiliar in a successful mélange, but it also tied everything together into a neat package through other means. “In the first and second movements of [the “Prague” symphony], Mozart couples strict canons and invertible counterpoint with such an accessible musical language that it’s easy to overlook the careful architectural planning that went into the work’s construction. These structural gambits were rendered crystal clear by the crisp sound of PBO’s instruments and their expert players. Nicholas McGegan and his merry band of singers and instrumentalists rolled into Tanglewood on Tuesday night to wrap up their tour of Handel’s great opera Orlando after taking it to Germany, Chicago, and New York City. The wear and tear of a tour were nowhere evident in their joyful presentation of music and theatrics—the performers still sounded like they were in the thrall of first love with this rich and rewarding score. 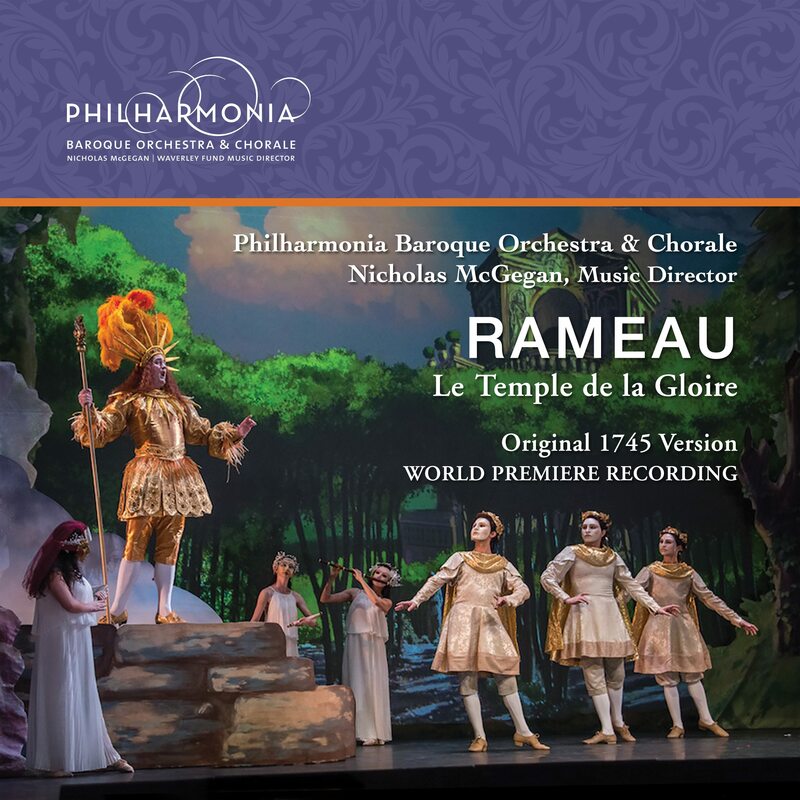 “…The spectacular touring production of Orlando that touched down at Ravinia’s Martin Theatre Thursday night celebrates the 30th anniversary of the San Francisco-based Philharmonia Baroque Orchestra, which music director Nicholas McGegan has been leading for 25 of those years. “To hear a first-rate period-instrument performance of a Handel opera in an intimate venue with a large cast of singers who are true masters of the period technique that these works require is nothing short of a revelation. “…Orlando has a persuasive new champion in Nicholas McGegan, who led his superb Philharmonia Baroque Orchestra of San Francisco and five fine singers in an invigorating performance at Alice Tully Hall on Sunday afternoon, as part of the Mostly Mozart Festival. “…The soprano Yulia Van Doren made the most of these comic implications in her portrayal of Dorinda but never overdid them. Her voice blossomed as Handel fleshed out her character, and she — like the other singers here — brought consistently interesting, often athletic embellishments to the repeated sections. “…Dominique Labelle used her flexible, burnished soprano thoughtfully in her dignified characterization of Angelica, and her florid ornamentation was often dazzling. “There was magic aplenty on the stage of Alice Tully Hall during a concert version of Handel’s opera Orlando, presented as part of the Mostly Mozart festival. “The magician-in-chief was Nicholas McGegan, who conducted his Philharmonia Baroque Orchestra Sunday afternoon with unflagging energy and led five exemplary singers through their grueling paces in the solo roles.